If you’ve got a garden shed, then you might be thinking about painting it. But with so many colour options on the market, just what should you go for? We’ve got everything you need to know about painting your shed right here! Of course, painting your shed makes it more aesthetically pleasing so your garden looks nicer, but painting isn’t just about looks. When painted, your shed will last longer, since the paint will protect the wood. So painting is a sound investment. What colour you choose to go for really depends on what kind of look you’re after. But let us introduce you to some of the options. Perhaps you don’t want to make a feature of your shed, in which case you’ll want it to blend in to its surroundings. For this reason it can be a good idea to opt for the same kind of colouring as any surrounding architecture, such as a fence. Painting your shed a similar colour to its background will make it blend in so that you barely see it. Light colours are very fashionable at the moment, especially pale blues and greens. These choices are great if you don’t quite want your shed to blend into the background, but you also don’t want it to stand out too much. These pale blues and greens also weather quite well, so they’re more long lasting than a brighter or deeper colour would be. White is also a choice, and again it should be fairly long lasting. White does tend to show dirt though, so if you’re going for pure white you’ll need to be prepared to wash your shed once in a while (or douse it with the hosepipe). Another option is to paint your shed an accenting colour, picking up on colours that are already in your garden, perhaps from border plants. 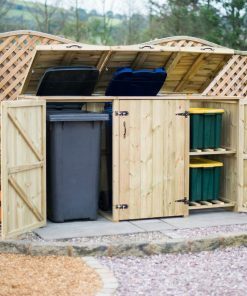 Going for this option means that your shed becomes one with your garden, it looks like it belongs there. Plus accenting colours tend to be brighter, though not so bright as to make a huge feature of your shed. Do watch out for weathering though, since bright colours tend to fade fast, especially if your shed is in bright sunlight a lot. Bold, bright colours like scarlet and deep blue aren’t for the faint of heart. Going bold means making a feature of your shed, but that’s not always a bad thing. A bright colour can really brighten up your garden, especially if your shed is in a darker corner (which is where many people choose to locate them). Again though, bold, bright colours tend to fade pretty fast, so be prepared to do some maintenance painting. Yep, black is always an option for everything, and your shed is no exception. Black is also quite a fashionable colour at the moment, though whether this makes your shed stand out or fade into the background depends on where it’s located. Black in a shaded area will make your shed blend in, whilst in a sunny area it will make it stand out. If you can’t quite decide on a colour, choosing a main colour with accents can help. Painting the main body of your shed one colour, and the doors or door frames and window frames a contrasting colour is a great way to make your shed look a little more, well, luxurious and expensive. Just be sure to choose two colours that complement each other and that aren’t too similar. Before you get down to some serious painting, there are some things to keep in mind. The first is that paint colours sometimes look different outside than they do inside, or in the pot. So always do a small test patch first to make sure the colour is really what you want. Secondly, you can’t paint wet or damp wood, so do make sure that your shed is dry. You’ll need to have a few sunny days in succession to make sure that all timber is properly dried out, and of course, you’ll need to paint on a sunny day as well. When it comes to the actual painting, things will go better if you do a little prep work first. Inspect your shed to ensure that there’s no fungus, mould, or moss on it. If there is, you’ll need to treat these things with an appropriate product from your DIY shop first. Then be sure to sand down your shed in order to let the colour go on more smoothly. Do use an undercoat, especially for lighter colours, since this will make the main colour stand out more. And be prepared to do at least two coats of your main colour, and allow plenty of time for the undercoat and first coat to dry before proceeding. You may find it easier to remove the door and sills (if possible) before painting, though this isn’t strictly necessary. Why Stop at Your Shed? Now that you have undercoat, paint, sandpaper and experience, why stop at your shed? There are plenty of other things in your garden that can be painted. 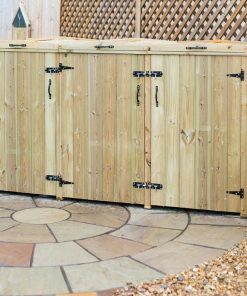 Bike stores, bin stores, even rain water barrels will all look great if painted, and will complement your newly painted shed as well. The only limit here is your imagination, so why not make your garden a riot of colour? Painting a shed can be hard work, but that effort does pay off in the end. Everyone wants their garden to look great, but plants and flowers aren’t enough. Adding a splash of colour to an otherwise boring shed can make the difference between an okay garden and an outstanding one.